Minister holding book standing beside a woman and a man who is holding a baby (the baby is wearing christening gown). They are standing in front of All Saints Church in Whitby, Ontario. 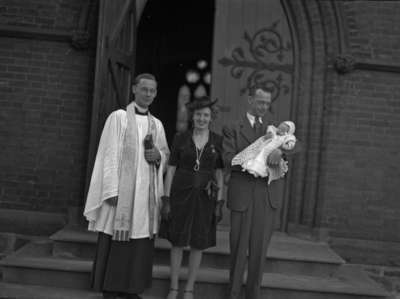 Jack Trueman - Christening of Baby (Image 1 of 2), 1945, Marjorie Ruddy. Whitby Archives A2013_040_1080.